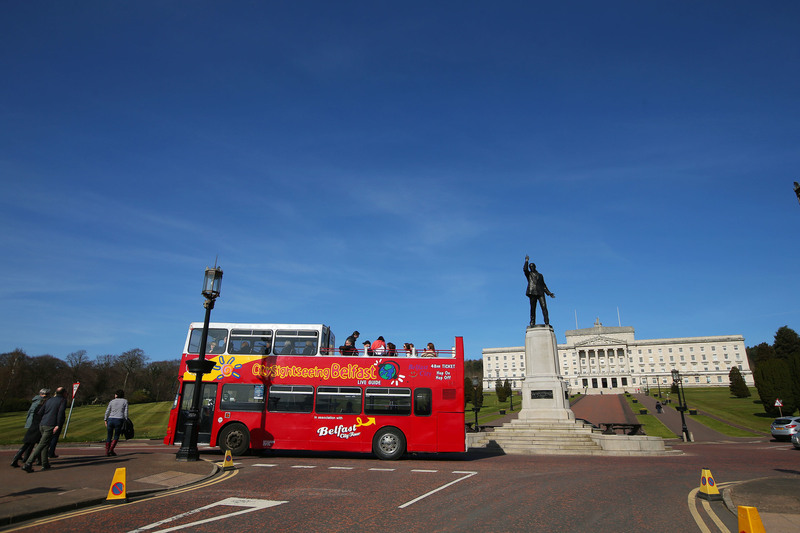 Each morning the brightly coloured tourist buses gather in the streets close to Belfast City Hall. The uniformed ticket-sellers comb the pavements for the tourists from the cruise ships and the hotels to sell them a tour of the city. New Zealanders, Japanese, Norwegians and Texans climb on board, ready to see what the National Geographic and the Rough Guide has assured them is one of the most exciting cities on the planet. The buses fan out to the areas where there is chance to get out and photograph the famous peace walls. For those expecting a continuous, Trump-like wall what they see is something of a disappointment: there is nothing grand about the interrupted series of fences, corrugated metal, and brick structures that stop and start in their zigzag progress through these depressed working-class neighbourhoods. The really remarkable thing though is that the walls are still here, in this city that describes itself in terms of its cool restaurants, cultural quarters and festivals. Weren’t the Troubles supposed to be over? Now there’s the possibility of a new barrier, one that would be the largest of all. If, as now seems inevitable, we are heading towards a hard Brexit then a hard border will follow. Theresa May has tried to give a reassurance that it won’t take the form of the border of old, and judged by what is happening in other EU frontiers that’s almost certainly true: the 21st century borders are controlled through infrared cameras, biometric sensors, drones, radar and blimps. But a hard border it will be and Ireland will be more effectively partitioned than at any time in its history. The creation of an exterior barrier will have a knock-on effect on the existing internal walls and, worryingly, it seems like Theresa May and her cabinet have no idea about the nature or extent of those divisions. In fact, it would be a good idea for them to join one of those tours. They would see that the problem is not just the walls. The neighbourhoods on both sides of those walls are showrooms of ethnic antagonism: painted kerbs, flags, murals of paramilitary heroes, and walls festooned with slogans. Drive out of Belfast and it’s different. There are still flags on the main roads but there is no longer the same sense of bristling hostility. The view from the tourist’s hire car is of a green and pleasant land. However, that’s simply because the signs are no longer so obvious. As the eminent historian A.T.Q. Stewart put it, “Topography is the key to the Ulster conflict. Unless you know exactly who lives where, and why, much of it does not make sense…Ulster’s troubles arise from the fact that people who live there know this information to the square inch, while strangers know nothing of it”. In one area it’s a river that divides the territory between Catholics and Protestants, in another it’s a stretch of industrial estate, while a market town may have all of one community on its east side and all of the other on the west side. Northern Ireland is still a very deeply divided society. In those areas where an actual physical barrier has had to be erected the numbers tell the story. 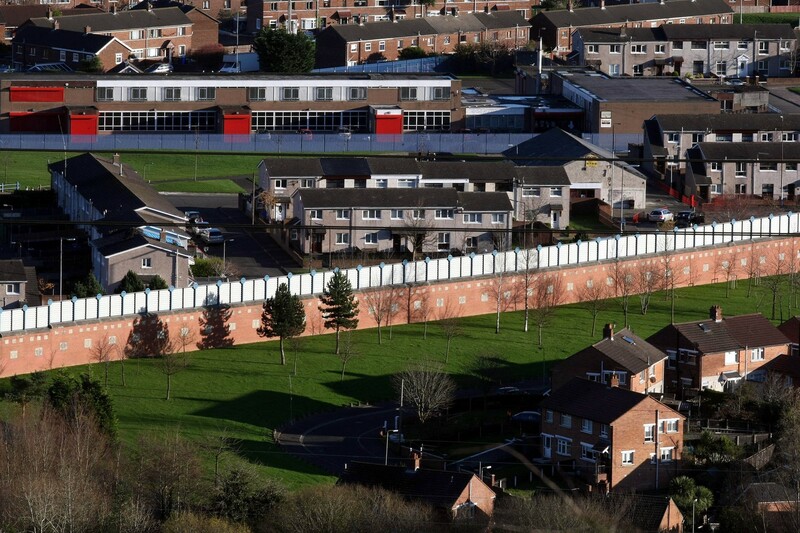 There are now a total of 109 peace walls across Northern Ireland. The Department of Justice owns 51, the Housing Executive 20. Others are in private ownership, perhaps attached to a supermarket, a drinking club or a community facility. The classic peace line splits a single area into two halves. But that’s only one kind. Some are erected to protect a landlocked enclave, where a small community is surrounded within a larger community of the other religion. The Fountain estate in Derry-Londonderry is a case in point, a small Protestant community left behind on the Catholic city side when their co-religionists migrated to live on the other side of the River Foyle. The Short Strand enclave is an example of the reverse pattern, a small nationalist island in the sea of east Belfast unionism. The high steeple of its Catholic church has attracted loyalist attack for generations - indeed it was first identified as a flashpoint back in the mid-19th century, and has been targeted in every decade since then. During the loyalist flag protest in the winter of 2012/13 there were vicious street battles with Short Strand residents, and even after the protests finished the skirmishes continued. In November 2013 a wire mesh, retractable barrier had to be erected in the actual grounds of the church because of the projectiles exchanged between the two sides. When we pull back the close-up of a micro case study like the Short Strand to the big picture of Northern Ireland as a whole we see a political geography that is just as divided and demarcated. The incoherent and jumbled mix of areas left over from the Ulster Plantation of the early 17th century has left two communities – then known as the planters and the Gaels, now as Protestants and Catholics – frozen in separate but parallel lives. Economic, familial and cultural ties have bound them together over the centuries, but without a common identity to unite them. Despite the progress made by the peace process, there is no time when they stand together to sing the same anthem or salute the same flag. Spatial segregation has proved effective in ‘preserving the integrity of their quarrel’, to use Churchill’s phrase. It would be a mistake to see segregation as purely the result of individual choices. Rather it reflects in large part historic settlement patterns: the Ulster Plantation was concentrated in Counties Antrim and Down, and those are still the bastions of unionism while west of the River Bann the map shades into green. Social housing is almost completely segregated, so much so in fact that it is only in recent years that the NI Housing Executive has changed its application forms to allow prospective tenants to tick a box for ‘mixed housing’, rather than expressing a preference for a Catholic or a Protestant area. And while that represents progress the move is largely symbolic since there are no more than a few small pilot schemes on offer, reflecting the reality that public housing is confined to working-class neighbourhoods. Without exception these are all deeply segregated and made up for the most part of ‘stuck’ communities – that is, people who were born into those areas and with very limited social mobility. In other words, they didn’t choose to live there from any sectarian motivation; rather, life circumstance placed them there and with that accident of birth came a community identity. The bar by which a community is deemed to be single-identity is usually set at 80% of one religion, but there are parts of Northern Ireland where local communities are even more homogeneous. Shantallow East in Derry-Londonderry is actually the most densely Catholic area in the whole of Ireland with 98% of its population declaring themselves Catholic. By way of comparison the most Catholic area in the south of Ireland is South Tipperary where Catholics make up 91% of the population. In Northern Ireland a single-identity community is invariably a poor area, as measured by the Multiple Deprivation Measure (MDM). Creggan features near the top of the MDM wards. The Whiterock ward, deep in the heart of republican west Belfast, was recorded in the last census as being 93% Catholic. On the MDM league table it is also recorded as being the single most deprived ward in Northern Ireland. The Shankill ward is 85% Protestant and ranks as number four on the MDM index. An obvious consequence of residential segregation is the lack of opportunity to have meaningful contact with people of the other religion. Education could provide such an opportunity for contact but the integrated schools movement has lost its momentum. Lagan College, the first integrated school, opened its doors in 1981, but thirty-six years later the enrolments for 2016/17 show that only 6.9% of children in Northern Ireland are educated together. Residential segregation is part of the problem: it is hard to have a local integrated school when all the children in the neighbourhood are of the same religion. But there’s also been a lack of government commitment. Despite support for integrated education being written into the Belfast agreement, there has been a failure to turn the pledge into a programme of action. The same is true of shared housing, something that only made its way onto the political agenda in recent years, and which has yet to gain traction. It could be different and, briefly, it seemed like it might. The Fresh Start Agreement of 2016 committed £500 million to integrated education, shared education and shared housing over a 10-year period. The first year saw most of the annual £50 million budget spent, but in the second year only £3 million was spent. What can explain this lack of support for social programmes that, to the outsider, are so obviously the way the society can repair its divisions? The answer lies in the nature of the peace agreement negotiated in 1998. To the disappointment of many, it did not manage to heal sectarian divisions in a warm bath of reconciliation. That wasn’t the nature of the deal. Instead it took the two communal identities as fixed and immutable entities and built the political architecture on these two pillars. Parties in the assembly have to designate themselves as either nationalist or unionist (or, by way of negative designation, as ‘other’), the assumption being that these two identities will remain the organising categories for politics in the long-term. Along with that assumption is the hope that good relations can be fostered – but always on the ‘good fences make good neighbours’ model. Clearly there is an obvious benefit to the main parties in having their respective electorates corralled in manageable geographical areas where their voting choices are securely anchored. 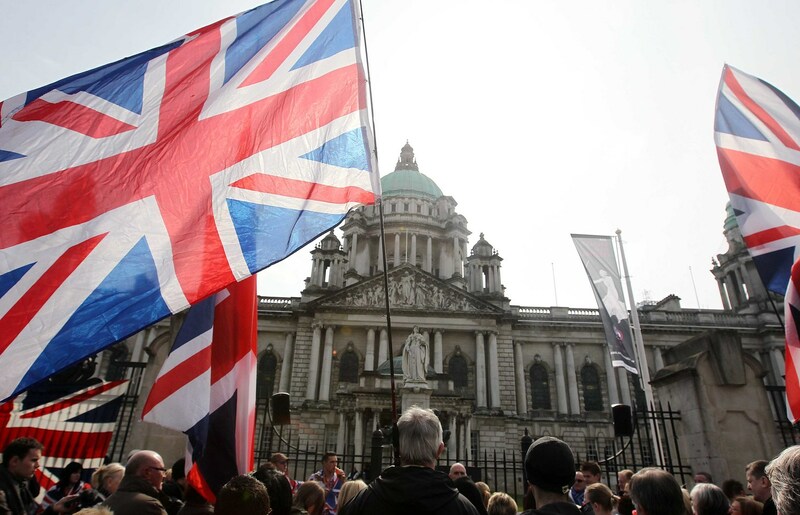 A study of voting patterns published by the Electoral Reform Society in February 2017 showed that just 4% of Catholics would give their first vote to a unionist party, while only 2% of Protestants would give their main support to a nationalist candidate. This makes for tidy electioneering and, it must be admitted, a certain type of equilibrium. It is best to think of the political model that emerged from the Belfast agreement through the metaphor of a seesaw, one that balances out power between two population groups. There is a consequence to this. As anyone who has ever sat on a seesaw knows, if your partner moves to the furthest on their side there is no point in you moving to the centre; you too have to move to the furthest point on your side to achieve the counter-balance. That in effect is what has happened in Northern Ireland: the two parallel electorates have moved their support to the extreme parties, Sinn Féin and the DUP, and the centre parties have lost out. The history of political events that brought us to this point has been described in countless books, but the underground forces shaping that history can be told much more simply through maps. Thanks to the new technology of the Geographical Information System (GIS) a new kind of spatial history can be examined. This allows for statistics from census records to be combined with information on changing boundaries in such a way as to allow a much deeper analysis of the fine grain of demographic data. The long-term analysis shows the truth of John Maynard Keynes’ observation: ‘The slow movements in population shift are responsible for the most profound changes in history’. When the demographic maps of Northern Ireland are examined in historical sequence it becomes very clear why Northern Ireland emerged from single party dominance to the current power-sharing model. The first census after partition showed a 2:1 ratio in favour of Protestants. This was no accident: the boundaries of the state of Northern Ireland had been calculated to ensure that the polity would have stability through the ballast of a strong Protestant majority. It is surprising how long this stability lasted, given that the higher birth rate among Catholics ought to have changed the ratio over time, but Catholic emigration served to depress the numbers. In the 1971 census the Catholic population remained at 34%, almost exactly what it had been at the time of partition. The old Stormont regime, ‘a Protestant parliament for a Protestant people’ was a reflection of this demographic reality, but the changing demographic was the bomb ticking under it. By the time of the 2001 census the Catholic population had increased to 43.8%, and by 2011 to 45%. Significantly, the 2011 census also showed that, for the first time, Protestants no longer made up the majority of the population, the new total having fallen to 48%. As we are currently between census counts we do not know what the 2017 ratio is, but extrapolating from the higher percentage of Catholics in the younger age cohorts in the 2011 census it is safe to assume that the two population groups will have drawn level. Power-sharing therefore becomes the obvious form of government so long as politics is based on communal identities. Whether or not it proves stable though depends on something else. The census data shows that in the counties that directly adjoin the border the British identity is weak: in Derry, for example, only 20% of the population regard themselves as British and in Newry only 17%. These cities are close to the border, but to what is currently an extremely porous border. A drive from Derry to Letterkenny or from Newry to Dundalk reveals no visible evidence of a border of any kind. Brexit is set to change that completely. 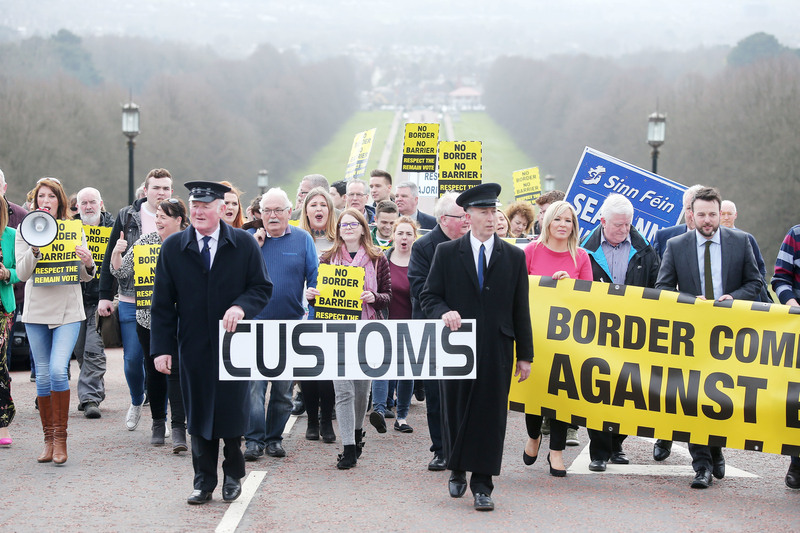 Nationalists who backed the Good Friday agreement because of its ‘creative ambiguity’ around national identity will find that in the future there will be no such ambiguity about the borders of the state they inhabit. A hard border will come between them and what they think of as their historical and cultural hinterland, and they will find themselves on the British side of a widening gap. The morning after the Brexit vote the leader of the Ulster Unionist Party said that ‘the constitutional question has been re-opened, and we now have people who were content in Northern Ireland thinking again about a United Ireland’. Those internal maps may also have to be re-drawn. RETURN to main article here. Paul Nolan is an independent researcher who has monitored the peace process in Northern Ireland and who writes on the problems of post-conflict societies. Ciaran Hughes is a Belfast based researcher who has published on segregation, community identity and civil society in Northern Ireland. The really remarkable thing though is that the walls are still here, in this city that describes itself in terms of its cool restaurants, cultural quarters and festivals. Weren’t the Troubles supposed to be over? Now there’s the possibility of a new barrier, one that would be the largest of all. If, as now seems inevitable, we are heading towards a hard Brexit then a hard border will follow. Theresa May has tried to give a reassurance that it won’t take the form of the border of old, and judged by what is happening in other EU frontiers that’s almost certainly true: the 21st century borders are controlled through infrared cameras, biometric sensors, drones, radar and blimps. In fact, it would be a good idea for them to join one of those tours. They would see that the problem is not just the walls. The neighbourhoods on both sides of those walls are showrooms of ethnic antagonism: painted kerbs, flags, murals of paramilitary heroes, and walls festooned with slogans. Drive out of Belfast and it’s different. There are still flags on the main roads but there is no longer the same sense of bristling hostility. The view from the tourist’s hire car is of a green and pleasant land. However, that’s simply because the signs are no longer so obvious. In one area it’s a river that divides the territory between Catholics and Protestants, in another it’s a stretch of industrial estate, while a market town may have all of one community on its east side and all of the other on the west side. Northern Ireland is still a very deeply divided society. In those areas where an actual physical barrier has had to be erected the numbers tell the story. There are now a total of 109 peace walls across Northern Ireland. The Department of Justice owns 51, the Housing Executive 20. The most contentious are in north Belfast where a patchwork of small orange and green areas are rammed up against each other, and it is here in places like Ardoyne that the divisions prove most combustible in the marching season. When we look at Northern Ireland as a whole we see a political geography that is just as divided and demarcated. The incoherent and jumbled mix of areas left over from the Ulster Plantation of the early 17th century has left two communities – then known as the planters and the Gaels, now as Protestants and Catholics – frozen in separate but parallel lives. Economic, familial and cultural ties have bound them together over the centuries, but without a common identity to unite them. There is no time when they stand together to sing the same anthem or salute the same flag. It would be a mistake to see this spatial segregation as purely the result of individual choices. Social housing, for example, is deeply segregated but these are ‘stuck’ communities with very limited social mobility. In areas where over 90% of the population share a single religious identity sectarianism reproduces itself through a loop of cause and consequence. For children growing up in residentially segregated areas there is a lack of opportunity to have meaningful contact with children of the other religion. Education could provide such an opportunity but the integrated schools movement has lost its momentum, enrolling under 7% of pupils in the current year. There has been a lack of governmental commitment to either integrated schools or integrated housing. For the two main political blocs there is an obvious benefit in having their respective electorates corralled in manageable geographical areas where their voting choices are securely anchored. The peace agreement negotiated in 1998 took the two communal identities as fixed and immutable entities and built the political architecture on these two pillars. Parties in the assembly have to designate themselves as either nationalist or unionist (or, by way of negative designation, as ‘other’), the assumption being that these two identities will remain the organising categories for politics in the long-term. The history of political events that brought us to this point has been described in countless books, but the underground forces shaping that history can be told much more simply through maps. The first census after partition showed a 2:1 ratio in favour of Protestants. In the 1971 census the Catholic population remained at 34%, almost exactly what it had been at the time of partition. It was after this the seesaw began to tilt. By the time of the 2001 census the Catholic population had increased to 43.8%, and by 2011 to 45%. Significantly, the 2011 census also showed that, for the first time, Protestants no longer made up the majority of the population, the new total having fallen to 48%. An equal balance of populations on the demographic seesaw requires a power-sharing government, but that on its own is not sufficient to guarantee stability. For that, there must also be stability in the surrounding arrangements. Brexit is now the threat to that stability. Nationalists who have lived close to a border so porous as to be non-existent will find themselves bumping up against a new reality that will separate them from what they think of as their historical and cultural hinterland. The 2011 census showed that in Derry only 19.8% identified themselves as British and in Newry it was only 16.9%. The implications are inescapable. The morning after the Brexit vote the leader of the Ulster Unionist Party said that ‘the constitutional question has been re-opened, and we now have people who were content in Northern Ireland thinking again about a United Ireland’. Those internal maps may also have to be re-drawn.